Rahul Gandhi alleged at the rally that the then Defence Minister Manohar Parrikar was not aware of the changes in the deal. He said Prime Minister Narendra Modi changed the contract. 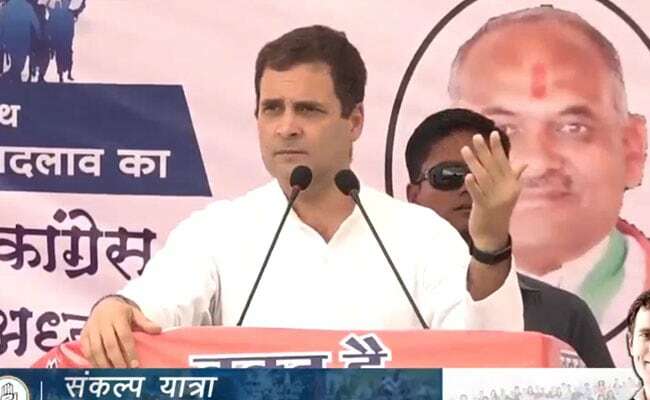 Launching a sharp attack on the central government over the Rafale jet deal, Congress president Rahul Gandhi said on Saturday that the state-owned aircraft manufacturer, Hindustan Aeronautics Limited or HAL, had made the fighter planes that dropped bombs on Pakistani soldiers during the Kargil war in 1999, but the government still sidelined the company. "During the Kargil War, HAL aircraft dropped bombs on the Pakistan Army. HAL knows how to make aircraft. The talks were confirmed. HAL discussed with France's Dassault to buy one aircraft for Rs 526 crore. After that, 'Chowkidar' became the Prime Minister. Soon after that, Prime Minister Modi visited France along with Anil Ambani. What happens next is that the Rs 526 crore aircraft now gets sold for Rs 1,600 crore. HAL is sidelined and Anil Ambani is made the offset partner. Anil Ambani never made an aircraft. HAL has been making aircraft for the last 70 years," Rahul Gandhi said today at a rally in Madhya Pradesh. The deal for the 36 fighter jets with France has turned into a huge political controversy in India. The Congress has been alleging that the company that manufactures Rafale jets, Dassault, chose Reliance Defence, owned by industrialist Anil Ambani, as an offset partner, overlooking the government-owned company that has expertise in the field. The party has been alleging that the French company was under pressure from the Indian government to pick Reliance. The central government, the French government and Dassault have rubbished the allegations levelled by the Congress. "The IAF came to the UPA government and said that they want 126 fighter jets. The UPA government asked them to look around the world and buy the aircraft they find the best and buy them at the cheapest price. But we told them that the aircraft will be built in India as the youth want jobs and it will be made by HAL. Air Force people said that it's totally correct," Mr Gandhi added. He alleged at the rally that the then Defence Minister Manohar Parrikar was not aware of the changes in the deal. He said Prime Minister Narendra Modi changed the contract. "He (Parrikar) stood up and said, 'I didn't do this job. I don't know what happened.' Prime Minister himself changed the contract. The French media asked them what has happened. How come Rs 526 crore became Rs 1,600 crore? Who is this Anil Ambani? How come he got this contract? Our press is a bit hesitant (in asking such questions)," he said. The Congress president has attacked PM Modi and his government over Rafale deal all through the election campaign in Madhya Pradesh. Defence Minister Nirmala Sitharaman on Friday said Mr Gandhi is "misguiding" people on the Rafale fighter aircraft deal with France. "If he contacts and holds discussions with former Defence Minister (and Congress leader) AK Antony on the process of procurement in the Rafale deal, he will understand it. But his intention was not to understand it. His intention is to misguide people over Rafale deal, so wherever he goes he raises it to misguide people," she said. The assembly elections in Madhya Pradesh will be held for 230 seats on November 28, and the result will be declared on December 11.